MILAN (Bloomberg) -- Fiat S.p.A. CEO Sergio Marchionne has rejected overtures from Volkswagen AG and says Alfa Romeo isn't for sale. That means at least two more years of depressed profit for the Italian company's shareholders. Fiat is currently losing about 300 million euros ($416 million annually on the brand, estimates Max Warburton, a Sanford C. Bernstein analyst in London. Marchionne, who says he needs to sell 300,000 Alfa Romeos a year for the brand to turn a profit, doesn't expect to reach that goal until 2013. Alfa Romeo, which made its first model in 1910 and was withdrawn from the U.S. in 1995, is Fiat's only entry in the volume section of the luxury auto market. Volkswagen is interested in buying Alfa Romeo, supervisory board Chairman Ferdinand Piech said last month. Marchionne responded by saying he will rebuild the brand himself by developing new models and reentering the U.S. His plan will be expensive, shareholders said. Marchionne aims to raise Alfa Romeo sales fivefold to 500,000 in 2014 by reintroducing the unit to the U.S. in late 2012 with the Giulia sedan and station wagon as well as a sport-utility vehicle it's building with Chrysler Group, of which Fiat owns 20 percent. Fiat, which doesn't disclose Alfa Romeo's earnings, declined to discuss the unit's finances. Alfa abandoned North America 15 years ago after sales in the region plunged to 565 cars. The CEO targets 2014 U.S. deliveries of 85,000. “Marchionne may get a higher price from VW for Alfa in a couple of years after the new models hit a less depressed European market and enter the U.S.,” said Emanuele Oggioni, who manages 650 million euros, including Fiat and VW shares, at Saint George Capital Management in Lugano, Switzerland. The brand, whose nine-month European deliveries fell 7 percent to 80,000 cars, could be worth as much as 4 billion euros if it reaches its 2014 goal, said Warburton, who first predicted VW's interest in December 2009. Fiat, which outbid Ford Motor Co. in 1986 to buy the unit from the Italian government, positions Alfa Romeo between the namesake brand offering Puntos and Pandas for as little as 9,200 euros and the Ferrari and Maserati divisions selling supercars costing as much as 400,000 euros. Alfa Romeo plans to double deliveries in 2011 on demand for the Giulietta introduced this year at a base price of 20,300 euros. Fiat received 30,000 orders for the hatchback, which was unveiled in Geneva in March, through the end of September. Marchionne has enlisted movie star Uma Thurman to revive the unit. The actress, featured in Giulietta advertisements, is luring women to the typically masculine brand. One-quarter of Giulietta purchasers are women, who usually represent about 7 percent of buyers, said Roberto Ferrari, chairman of Alfa Romeo's Italian dealers association, referring to sales at his dealership outside Milan. Alfa Romeo sales will likely increase more than 25 percent in Italy in 2011, he said. Fiat in January appointed Harald Wester, the automaker's technology chief and CEO of the Maserati and Abarth brands, to remake Alfa Romeo. Among new vehicles the carmaker plans to build is a mid-sized sedan. 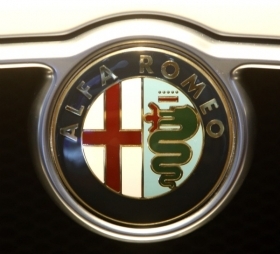 Fiat is counting on renewed Alfa Romeo enthusiasm in the U.S. to boost sales. A limited edition of the 8C Competizione, originally built in the 1930s, was sold last year in coupe and spider versions for as much a 213,000 euros. All 1,000 cars were purchased, with 200 of them going to the U.S. Fiat and Alfa Romeo will “more than likely” be sold in the same U.S. showrooms when the brands are reintroduced, Marchionne has said. 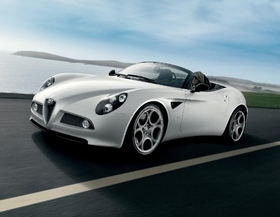 The Alfa 8C Spider boosted U.S. interest in Alfa.